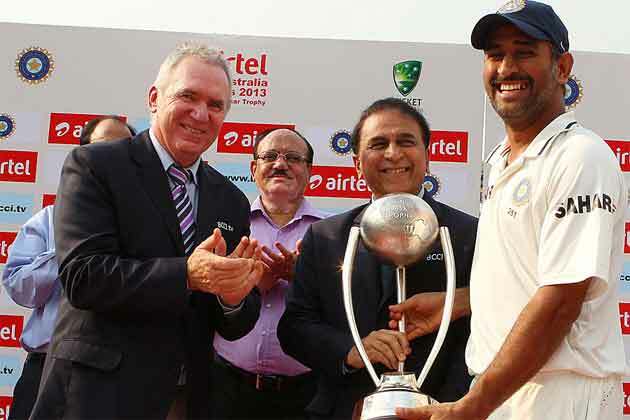 # Mahendra Singh Dhoni became the first skipper to post eight consecutive Test wins against Australia on Indian soil. Under his leadership, India have won 24, lost 12 and drawn 11 out of 47 contested -- success % 51.06. # Australia has lost eight tests in a row to a skipper for the first time in an overseas tussle. # Dhoni is the first Indian skipper to register a clean sweep in a series of four tests against any side. # India, for the first time, have won a test series by 4-0 -- their first instance of four consecutive test wins in a series. They have achieved three successive series wins against Australia on Indian soil -- 2-0 in 2008-09; 2-0 in 2010-11 and 4-0 in 2012-13. # Australia, for the second time, has been whitewashed by 4-0 in a Test series after their 4-0 clean sweep to South Africa in 1969-70. # Ravindra Jadeja (5-58) has recorded his first five-wicket haul in test cricket, eclipsing the 3 for 33 against Australia at Hyderabad. # Jadeja's superb match figures of 7 for 98 (2-40 & 5-58) are his best in a Test match, surpassing the six for 66 against Australia at Hyderabad. His brilliant performance has earned him his first Man of the Match award in tests. # Cheteshwar Pujara has registered strike rate of 89.13 (82 not out off 92 balls) -- the third highest in the fourth innings of a Test match for India. # Pujara has posted fifties in each innings of the Delhi Test -- a feat recorded by him for the first time. # Pujara, in two consecutive series, has registered 400 runs or more for the first time, totalling 438 (ave. 87.60) against England in 2011-12 followed by 419 (ave. 83.80) against Australia in the just concluded rubber. # Nathan Lyon (7-94) has registered his best bowling performance in tests, outstripping the 5 for 34 against Sri Lanka at Galle in August 2011. # Overall, Lyon has taken five wickets or more in an innings three times -- his third-best being 5 for 68 against the West Indies at Port of Spain in April 2012. # Ashley Mallett had captured 6-68 in 1969-70 -- the previous best figures by an Australian bowler at Feroz Shah Kotla. # Lyon's excellent performance of 7-94 is the sixth best by an Australian bowler in a Test innings at Feroz Shah Kotla. His match figures of 9 for 165 are his career-best in a Test match as well as the best by an Australian bowler at this venue. # At Feroz Shah Kotla, India have won 12 Tests out of 32 contested -- the second highest tally of wins registered by them, next only to the 13 out of 31 at Chepauk. # India have won nine out of the last ten Tests played at Kotla -- the remaining one could not produce a result. # Ravichandran Ashwin, with 29 wickets at 20.10 runs apiece, has finished as the leading wicket-taker followed by Jadeja -- 24 (17.45). Jadeja's bowling average is the best in the just concluded rubber. # Ashwin's tally is the third highest by an Indian bowler in a Test series against Australia behind Harbhajan (32 at 17.03 runs apiece in three Tests in 2000-01) and Bishan Singh Bedi (31 at 23.87 runs apiece in five Tests in 1977-78). # This was Ashwin's first Player of the series award against Australia and his third in Tests. # Peter Siddle (51 & 50) became the first number nine batsman to make fifties in each innings of a Test match. He is the first number nine batsman to top score in each innings of a Test match. # Siddle became the fourth Australian number nine batsman to post 100 runs or more in a Test match, joining Jack Gregory, Clem Hill and Ray Lindwall. # With 430 runs at an average of 61.42, Murali Vijay is the leading run-getter in the series. # Two Australian spinners opened the second innings -- Lyon and Maxwell, providing the third instance when Australia opened the bowling attack with two spinners.